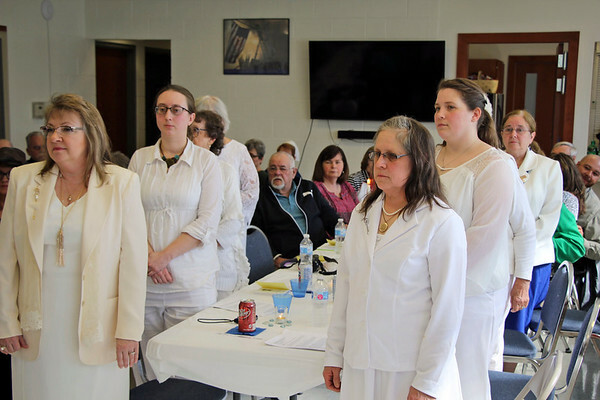 Charter members of the new Arsinoe Martin Circle of the Ladies of the Grand Army of the Republic hereditary society prepare to receive their charter from executives of the national group Sunday during a ceremony at the Jefferson Township Fire Dept. From the left column: Kathrynmary Schultz, chapter treasurer; Sarah Wright, chapter conductor; RoseMary McDaniel. From the right column: Elizabeth Thurston, chapter president; Jessica England, chapter secretary; Catherine Reedy, chapter chaplain.